One of the fascinating things about black holes is their scale. 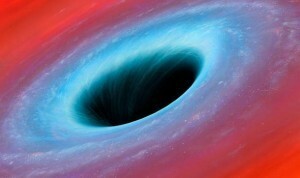 In principle, black holes are determined by density. If matter reaches a critical density, then it will collapse under its own weight. It’s a collapse nothing can prevent, not even the strongest repulsive forces in the nucleus of an atom. When talking about black holes we can imagine the Sun collapsing to the size of a city, or the Earth squeezed to the size of a marble, but neither the Earth or Sun are massive enough for that to happen. Black holes occur when more massive stars explode as supernovae, or when the centers of proto-galaxies collapse into supermassive black holes. 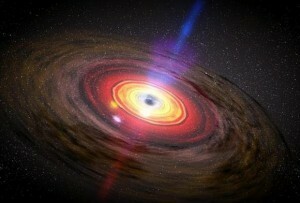 But as strange as they are, we know black holes exist. We see evidence of them throughout the universe. But sometimes it’s fun just to sit back and take in the tremendous matters of scale that black holes represent, as seen by the video above. It’s kind of funny to talk about a 20 billion solar mass black hole but then it’s just an abstract number, really. It looks completely different when you watch the video clip and see those 20 billion sun-like stars.